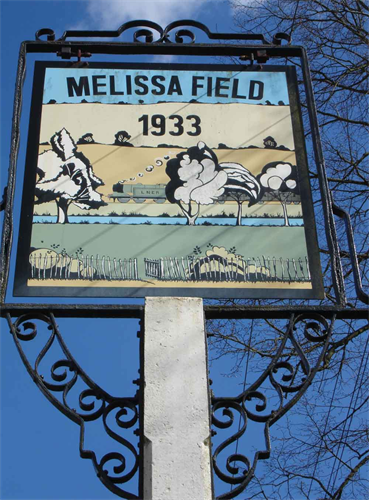 Melissa Field is located opposite the entrance to Folly Fields, along the Lower Luton Road towards Harpenden. It is marked by a pub-style sign that originally marked the Rose and Crown pub located on the other side of the road (now a private house). The 2.5 acre (1 ha) Field was donated to the Parish Council for “exercise and recreation” by Harold Fitch Kemp in 1932 in memory of his daughter. 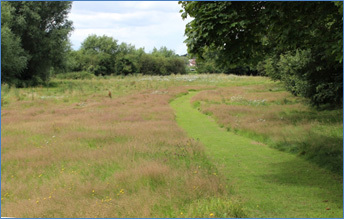 In 2011 the Parish Council reviewed all of the land it owns with a view to getting a balance between closely mown open spaces used as play areas (such as at the top of Folly Fields)and land maintained for ecological benefit. Next to the River Lea, Melissa Field was identified as having high potential as an important habitat and corridor for wildlife. To encourage wildlife we decided to cut and lift the grass annually allowing plant species to flourish and to cut paths through the grass for visitors. for ecological wonderful willow trees on the riverbank and volunteers have planted many new trees and shrubs on the western boundary. The area has for wildlife play areas wild flower meadow with many dozens of plant species grass annually. Some work has been done to reduce the number of nettles the grass. In the future, growth close to the river will be reduced to improve access. The field is an ideal picnic spot with country views across the river. You can find parking at the top of Folly Fields and it is just a short walk (200 yards) back down the hill to the Field. The playing field at the top of Folly Fields is ideal for those wishing to play ball games but Melissa is ideal for those wishing to relax in a more ecologically rich environment where we are encouraging wild flowers, butterflies, bats, birds and small mammals.